I. Trends in Ecological Modelling (Invited papers). Trends in ecological modelling (S.E. Jørgensen, H.F. Meyer). On the quantitative dominance of indirect effects in ecosystems (B.C. Patten). Modelling reality: fact, fancy, fiction (R.G. Woodmansee, W.K. Lauenroth). II. Theory and Methods of Ecological Modelling (26 papers). III. Application of Ecological Models to Animals (16 papers). IV. Application of Ecological Models to Land Resources (16 papers). V. Application of Ecological Models to Water Resources (30 papers). VI. Application of Ecological Models to Energy Development (10 papers). VII. Summary and Synthesis (5 papers). The International Society for Ecological Modelling (ISEM) sponsors conferences, workshops and training courses with the aim of advancing the development of ecological and environmental modelling. The 3rd International Conference on the state-of-the-art in ecological modelling was sponsored by the ISEM in cooperation with the National Park Service Water Resources Laboratory and hosted by the Natural Resource Ecology Laboratory at Colorado State University. 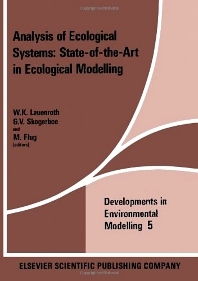 Its theme was the application of ecological modelling to environmental management and this book contains the full texts of the three invited papers presented in the five general sessions, plus the final summaries and syntheses of the topics covered during those sessions.